Fargo - ISO Magnetic Stripe Encoder|iCLASS and MIFARE/DESFire Card Encoder|Contact Smart Card Encoder, Single-sided printing, USB interface, no lamination. This is a Zebra printer repair part. 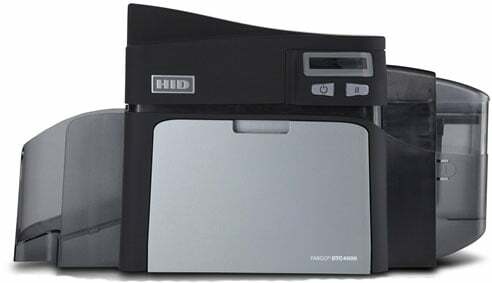 The Fargo DTC4000 is a plastic card printer that provides all the security of HID with all the reliability of Fargo for sharp, professional looking, high-quality ID cards and photo ID badges - easy and quick. With a small footprint, and an optional same-side input/output hopper, the DTC4000's minimum size was designed for maximum flexibility. And with upgradeable functionality and security, simple replacement of cartridge supplies, movable SmartScreen graphical display, and an easy, intuitive set up, the DTC4000 was made for organizations that want a higher level of security without the higher levels of capital investment and training time. We back each of our Direct-to-Card Printer/Encoders with a global 2-year warranty. A 7th generation product from Fargo, each printer now works seamlessly with HID readers and other asset protection modules. The Fargo 48212 is also known as Fargo Electronics	ZEB-48212	.